Preheat oven to 360°F | 180°C. Place chicken thighs in a large shallow dish and season with salt; set aside. In a large mixing jug, whisk together the honey, lemon juice, soy sauce, vinegar and minced garlic. Pour about ¼ cup of the sauce over the chicken (or just enough to lightly coat each thigh) and rotate each thigh to coat evenly in the sauce. Heat an oven-proof skillet over medium high heat; sear the chicken skin side down first until golden for about 5 minutes. Turn and repeat on the other side. Drain most of the excess oil from the pan, leaving about 1 tablespoon for added flavour. 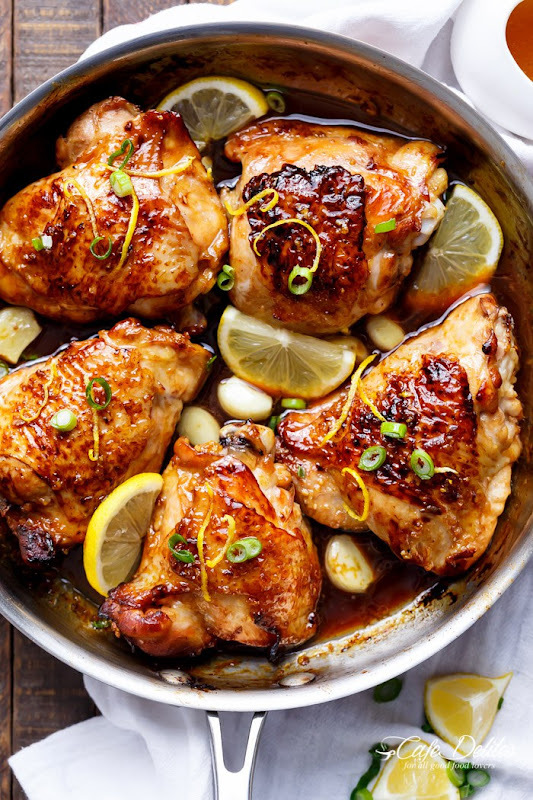 Arrange chicken skin-side up in the pan; add the whole garlic cloves between the chicken; pour half of the remaining sauce over each thigh (about 1-2 tablespoons per thigh) and bake for 40-45 minutes until the chicken is cooked through and the juices run clear. The skin should be crispy and sticky. While the chicken is baking, pour the remaining sauce into a small pot (or saucepan), and bring to a boil over medium-high heat. Reduce heat down to low and allow to simmer while occasionally stirring; lifting the pot off of the heat when the sauce bubbles up to the rim of your pot, and repeat the process until the sauce has sightly reduced and thickened (about 6 minutes). Serve with the remaining sauce, lemon zest and slices, and sliced green onions (optional).